A lazy prince lived in a beautiful and magnificent palace. The lazy prince was very spicy. One day if that lazy prince is unexpectedly stuck in a house in there. It is your duty to save the lazy prince from there that is stuck there. 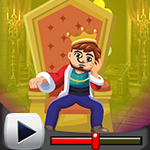 It will help you to find all the trunks that are hidden there to save that lazy prince. The lazy prince who is right there finds all the masks hidden there and saved you from there and wish you success in the game. The sparks in this game are a little hard to find, but somehow it may be interesting to find out. Good luck and have a fun !